Austin Texas, September 3rd, 2014 - TrustRadius, the leading community for professionals to share candid insights about business software, today announced the release of its TrustMaps™ for Digital Analytics software, which rank products based on user ratings and adoption within each market segment - small businesses, mid-size companies and enterprises. 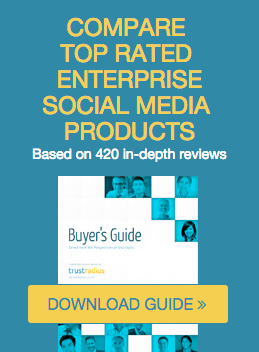 Unveiled in its first Buyer’s Guide to Digital Analytics Software, the TrustMaps™ quickly help software buyers locate the solutions most highly rated and adopted by their direct peer group and therefore most closely aligned to their needs. Each TrustMap™ depicts Digital Analytics products on two dimensions – likelihood to recommend ratings by users and the estimated relative number of websites using the product within that company segment size. All ratings come from authenticated reviews by end-users of the software on TrustRadius.com. The Buyer’s Guide also distills the pros and cons of each software product, as cited by software users in 230 in-depth reviews. Because success is not solely contingent on software selection, the guide includes a discussion of key factors for Digital Analytics success, drawn from interviews with highly regarded digital analytics experts.